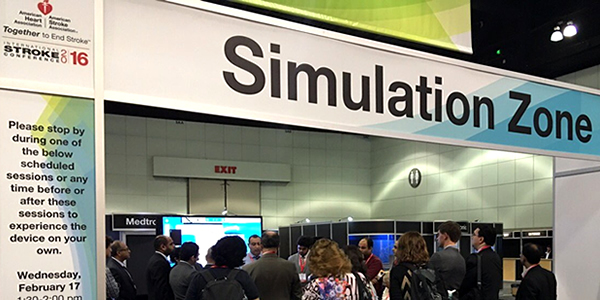 We have been invited by the American Heart / American Stroke Association to streamline the Simulation Zone at theInternational Stroke Conference, held on 17-19 February 2016 in LA. The space hosted training sessions about several stroke scenarios, which were moderate by highly respected speakers such as Dr. Adnan Qureshi, Dr. Helmi Lutsep, Dr. Nicole Gonzales, Dr. Patrick Lyden , Dr. Salvador Cruz-Flores and. Dr. Karen Furie. The Simulation Zone was a success and recorded a high number of visitors and participants which engaged in a wide discussion of the clinical cases.